Glance MC is a student-developed app that assists with daily task and activities at Manhattan College. Whether you want to increase your engagement in campus life, manage your school accounts, or simply use a digital version of your Jasper Card (your campus ID) Glance MC is there to provide you with easy-to-access information and resources. This is the Glance MC home page, where you can access personalized features like your Jasper Card, course schedule, To-Do list, search, and favorites. Glance MC is available on both the App Store and the Google Play. Signing into Glance MC with your JasperNet account gives you access to your digital Jasper Card and Courses. Favorites, Tasks, and Twitter accounts (that you subscribed to in your feed) are saved to your account. Whether you sign out or get a new phone, you always have this information with you. Glance MC is focused around the Home page. There you have quick access to information that is personal to you. 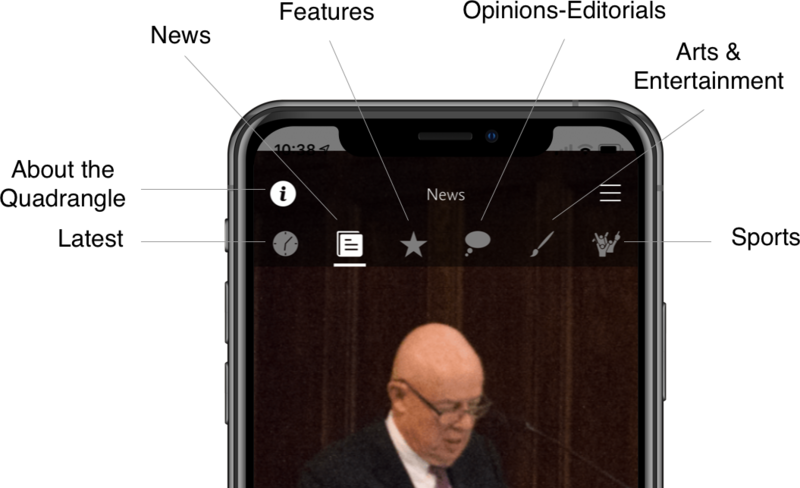 To navigate to other sections of the app, just tap the menu button, located on the top right side of the screen in iOS or top left side in Android, to open the menu. In the menu, just tap any feature and you will immediately be brought to that feature. The menu button, located on the top right of the home page, gives you to access to many of the features on Glance MC. The menu helps you navigate to any main section of the Glance MC. Glance MC is split up into multiple sections: Home, Feed, Calendar, Quadrangle, Invites, Settings, and Featured Links. 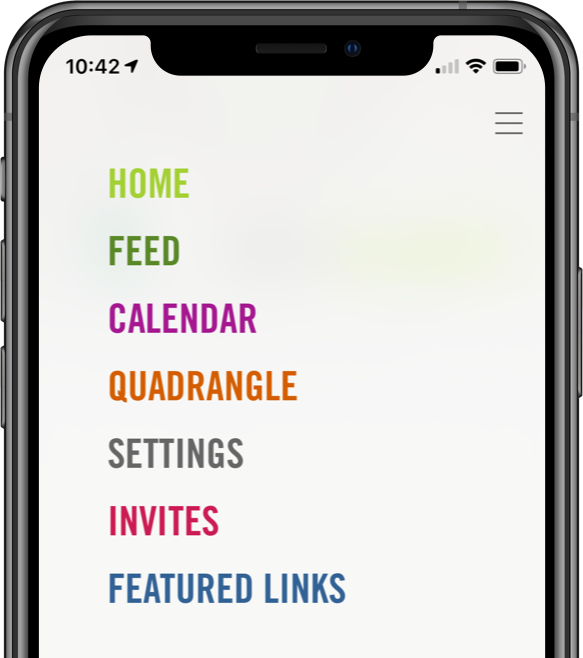 The menu displays a list of the sections in Glance MC: Home, Feed, Calendar, Quadrangle, Invites, Settings, and Featured Links. Everytime you open Glance MC, you will be brought to the Home Page. The Homepage is where you can access personalized features such as your Jasper Card, course list, to-do list, favorites, and search. Located at the bottom of the home page are all the buttons for the features such as the Jasper Card, courses, to-do list, search, and favorites. Tap the person icon in the bottom left side of the Home page. Sign in with your JasperNet credentials. Unlike your physical Jasper Card, which uses a magnetic strip, your digital Jasper Card contains a barcode. Just scan the barcode with an optical scanner located at many places on campus. Tap Add to Wallet to add your Jasper Card to Apple Wallet. Pro iOS Tip: Just double press your home button (iPhones prior to iPhone X) or side button (iPhone X+) and your wallet will appear on your screen. This is not enabled by default. You can enable this under Settings > Wallet & Apple Pay. Instantly find quick links and employees. How to find Employee Directory Information such as Office Location, Email Address, and Phone. Search for an employee or access them in your Favorites. Tap their listing to view their profile. Tap any of the buttons in the icon row to call, email, view office location of, or favorite the employee. The employee profile which contains directory information such as name, job title, and available contact information. Additionally buttons for directly contacting or locating the office of an employee. View favorite quick links and employees right from the home page. How to Add a quick link or employee to your Favorites. You can add a quick link or an employee to your favorites in two different places: Search or Favorites. Go to the search section by tapping on the magnifying glass icon on the home page. Search what you want to add to your favorites. For quick links, simply tap the outlined star next to the listing. For employees, tap the listing to go to their profile, then tap the outlined star. Tap the star icon on the bottom right of the home page to access favorites. Tap the box with the cross. Search for what you want to add. Tap the listing to save it to your favorites. View Course Schecule from Previous Semesters. Just tap the button with the current course semester. Then select the semester you desire. Glance MC includes a To-Do list where you can manually keep track of your assignments, test, and projects. To view your To-Do list, tap the check button located on the bottom of the home page. Adding a Task to your To-Do List. Tap the checked box on the bottom of the home page to go to your To-Do list. Tap the circled plus button. Press Add or Add Task to complete. Managing Task with your To-Do List. Tap the circle again to unmark it. To delete a task, swipe left on iOS or swipe right on Android. 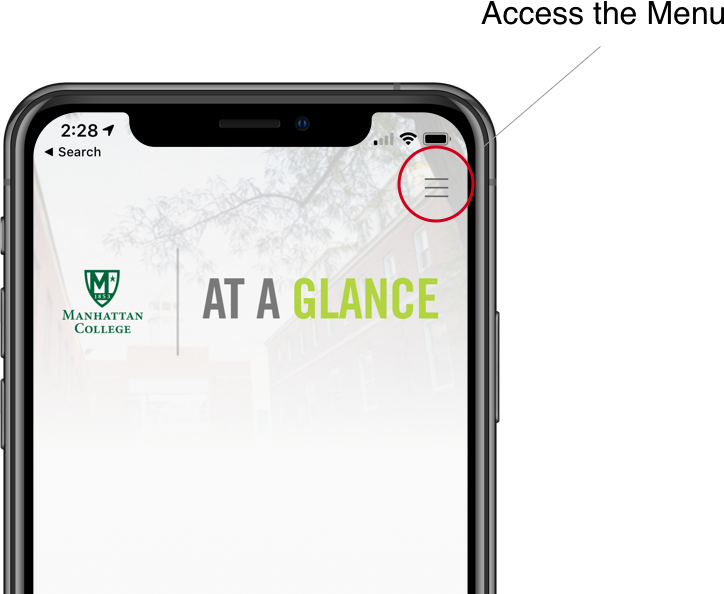 The feed allows you to browse through the latest announcements, news, and alerts at Manhattan College. 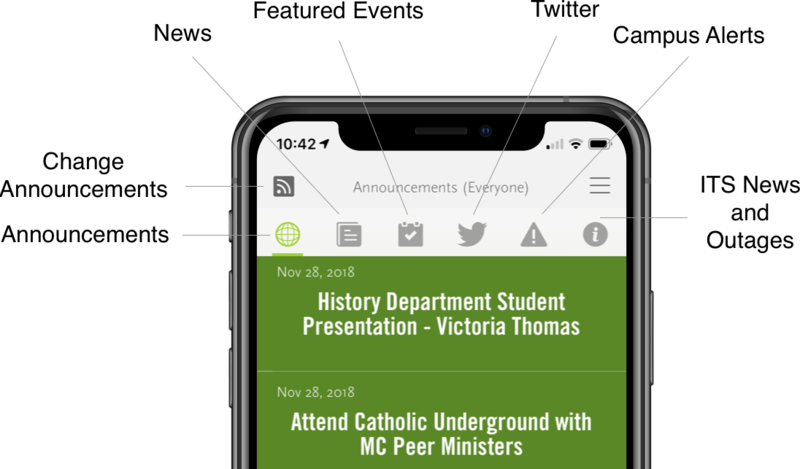 The top portion of the feed with tab buttons for each section of the feed: announcements, news, featured events, Twitter, campus alerts, and its news and outages. Browsing Posts: To navigate through posts, just swipe up and down. Switching Feeds: To switch between feeds, just swipe left or right or tap the feed icons located at the top of the screen. Tap a post to view a summary. Tap and hold a post to view it in full. Tap a post to view it. View events happening on campus. Tap on a listed event under a day to view it. Subscribing to calendars and events. You can subscribe to a calendar on your phone by pressing the plus button located on the top left of the calendar page. 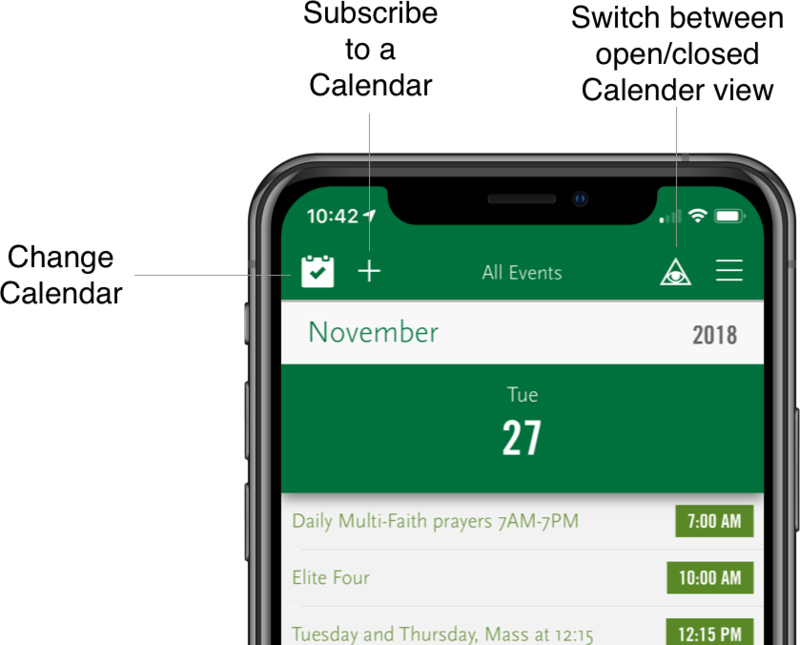 You can add an event to the calendar of your phone by pressing the plus located on the bottom right of an events page. The top portion of the calendar with buttons for changing the currently displayed calendar, subscribing to the current calendar, and changing the calendar view type. The Quadrangle is a news organization run by the students of Manhattan College. Browsing Sections: Swipe up and down to navigate through articles in a section. Switching Sections: Swipe left and right or tap the icons below the header to view. Viewing Articles: Tap an article to view it. The top portion of The Quadrangle with tab buttons for each section: latest, news, features, opinion-editorial, arts and entertainment, and sports. Invite other Students or Employees to download Glance MC. View featured quick links that help you with vital information such as Connecting to Wireless Display, Locate an Open Computer, and Report a Wifi issue in Dorm. Get notifications straight from the Glance MC development group. Check out this knowledge base article I found in the Manhattan College knowledge base. 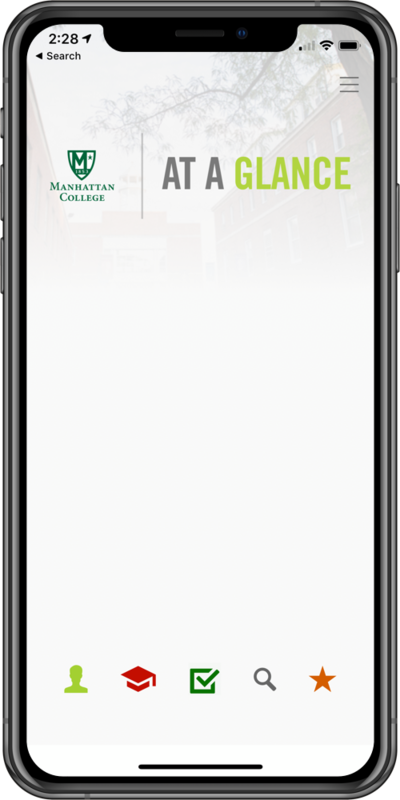 https://manhattan.teamdynamix.com/TDClient/KB/ArticleDet?ID=68606 Using Glance MC Instructions for using Manhattan College's student-developed Glance MC App. 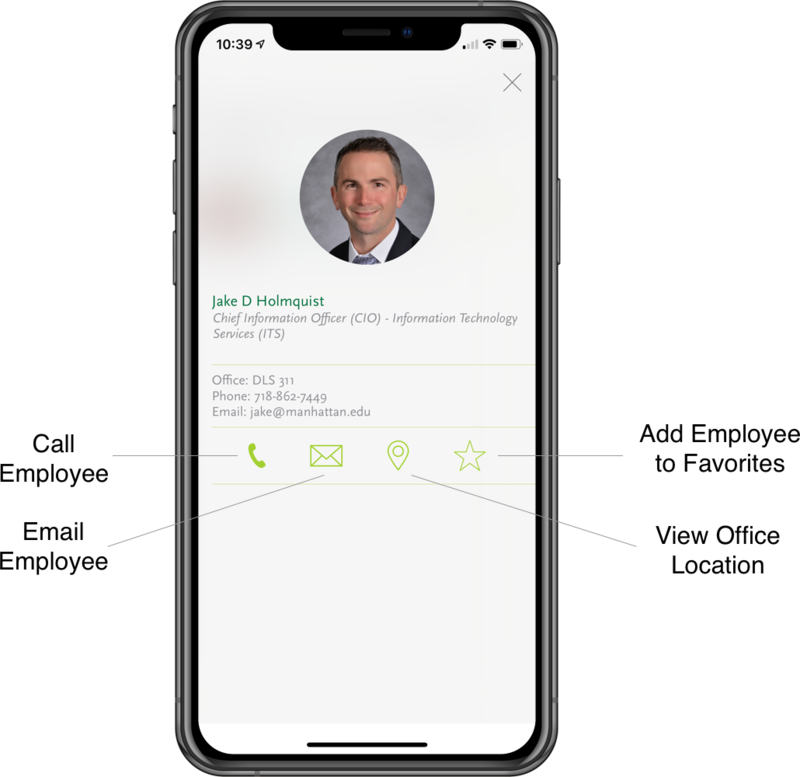 Native app features include digital version of one's Jasper Card, Class Schedule, To-Do list, Search of College Quicklinks and Employee Directory, College Announcements, Calendars, Twitter Feeds, Quadrangle etc.